Kitchen and Residential Design: Let's save some money! I have been on a real electricity conservation kick lately so I'm going to write some more about it today. In May, I finished swapping out the last of my light bulbs with CFLs, I increased the temperature setting on my fridge and I started turning off all of my power vampires when I leave the house in the morning. It worked. I just got my electric bill and I have halved my electrical use and more importantly to me, I have halved the amount of my bill. Hot dog! I really don't feel like I'm depriving myself of anything --I still run my air conditioning and I don't sit in the dark. But it's incredible to me that making some small changes like the ones I've made has netted me some real results. My beloved St. Pete Times ran the following this morning and I'm repeating it in toto here. Put off the flat-screen television purchase, or unplug the one you have when it is not in use. Many flat-screen televisions can use as much power as an energy-efficient refrigerator. Change to compact fluorescent light bulbs. The energy-saving light bulbs use about a third of the energy of incandescents. Set your thermostat between 78 and 80 degrees, or higher if you're comfortable. When you leave the house, turn it up by 5 to 7 degrees instead of turning it off. Use ceiling and portable fans to keep air moving. Ceiling fans can make a room feel 2 degrees cooler. Close drapes, blinds and shades in the hottest part of the day. Get a clothesline. It's hot out. Let the heat dry your clothes. A dryer uses lots of electricity, and adds heat to your house that your air conditioner has to work against. 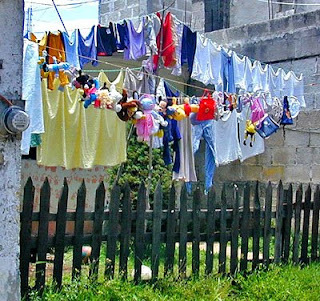 Florida law says homeowners associations can't ban clotheslines. Consider "zoned" air conditioning systems that allow you to cool only the rooms you are in, or a small window unit to cool only the rooms in use. Check with your utility about home energy audits that can see where you are wasting electricity. Some utilities also offer rebates on energy-saving devices like thermal wraps for water heaters or solar thermal hot water installation. Tampa Electric and Progress Energy offer audits and other programs. Turn your computer and monitor off. Screen saver modes save no power. Sleep modes continue to draw electricity. With most computers, powering it on and off does not wear it out. There is more wear and tear on electronics from the heat stress of constantly running. Unplug "vampires." These are cable boxes, televisions, phone chargers, iPod charging stations. All of them draw power even then they are not charging a device, and even when they are in sleep mode. These devices can add as much as 10 percent to your power bill. You can also put the devices on power strips, and turn the strip off when the appliances are not in use.